With the ability to perform a wider range of heavier lift tasks on construction and industrial jobsites, Genie® telescopic S®-85 XC™ booms now offer a dual lift capacity of 330 kg (660-lb) unrestricted and 454 kg (1,000-lb) restricted. And, the Genie Xtra Capacity™ (XC) feature gives customers the ability to work with up to three people on-board, while still leaving room for tools and jobsite materials. New to this generation of telescopic booms, the Genie XC models feature automatic envelope control. This is the ability to automatically retract as the booms reach their operating envelope, allowing for simple platform positioning and an enhanced operator’s experience. And, they are equipped with a load sense cell that continuously checks the weight in the platform and limits the operating envelope to match the load chart, all while boasting the ability to do zero-load field calibrations. The Genie S-85 XC boom also boasts an expanded working zone thanks to a new chassis tilt sensor incorporated into the machines’ function. This unique chassis tilt sensing technology gives operators access to different ranges of motion based on the chassis angle. And, it is engineered to automatically cut-out certain lift and drive functions of the machines when the tilt activation setting is reached. “Equipped with this new technology, Genie XC booms not only carry more load than ever before but also maximise access to hard-to-reach work areas on challenging jobsites,” adds Kinder. 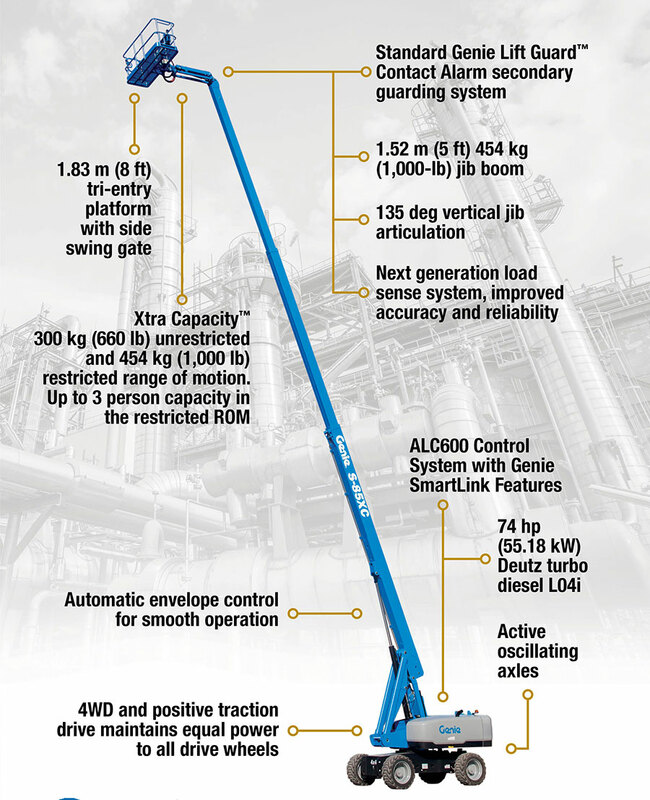 This new Genie XC model also features the new Genie Lift Power™ generator solution. This system includes a dedicated hydraulic circuit, a right-sized breaker and no pressure switch to reliably run the unit and allows for the power to lift and drive during operation. The Genie Lift Power system is available in 7 kW to provide reliable power solutions for customers in Australia. All Genie XC booms have been updated with a CAN-based control system, which incorporates the familiar Genie SmartLink™ control system features on these popular booms. Operators will find the control layout on these booms to be consistent and intuitive, making the operation of the booms easy and straightforward. The Genie S-85 XC boom has 27.91 m (91 ft) working height with 22.71 m (74 ft) of outreach. The XC design on these boom lifts also includes a 1.83 m (6-ft) dual entry or 2.4 m (8-ft) tri-entry platform with side-swing gate to make it easy to get people, tools and jobsite materials in and out of the basket.